affordable day care | Promotional Incentives, Inc.
It’s funny how you can work with an organization for some time before really grasping what it is they do. That is the scenario for me with Child Care of Southwest Florida. I knew they did a lot for the community by providing affordable day care for hard working-class families, but I had no idea the scope and quality of the multitude of educational opportunities offered. They’ve been raising awareness to the importance of early childhood structured education with a “Kindergarten is Too Late” campaign. To add visibility, CCSWF contacted Promotional Incentives for promotional buttons, and they’ve been “Getting Results.” Board members, contributors and community leaders are signing up to don the buttons to promote awareness. When I received an E-vite to tour a CCSWF Center, I signed up to go with a friend to take a one-hour tour of the Messina Center in Fort Myers. From the moment I arrived, an air of positive energy emanated from the clean and tidy facility. Children and adults were equally delighted to see each other. I witnessed several kids actually skipping to get in the door. Kind of squashed my pre-conceived notion of day care providers. The few memories I have of pre-school, after school or daycare, was they were pretty much an undesirable alternative to being home with mom. Messina Center Director Tammy Aronson is an amazing woman, and integral to the success of this (more than just) day care provider. She smiles constantly as she shows us each brightly colored and spatially organized room. As we walk down the halls with decorated walls, CCSWF Executive Director Beth Lobdell beams with pride as she describes the revolutionary software program (Teaching Strategies GOLD) that allows the leaders to tailor focus the curriculum to meet the individually educational needs of each student. This software has been made available thanks to generous contributions from members of our community. I’m in awe of the hours of operation: 6:30 am to 11:30 pm most days of the week. Workers split long shifts, and are encouraged to retire to the comfortable couch in the staff room to regroup and reenergize. Then we follow the homey scent, and go into the kitchen to meet their chef in residence, Carolyn Henderson who is preparing an appealing and nutritious dinner for the second shift. I learn about their ingenuity in their plan to provide healthy meals that kids would eat. You know what they did? It’s revolutionary folks…they asked the kids! Much against perception, the youth chose well: baby carrots over mushy peas, fresh spinach salads over overcooked canned spinach; with homemade macaroni & cheese and all-beef hot dogs a weekly treat, who wouldn’t be happy?! Every staff member greets us politely and exudes enthusiasm for their career. Sabrina Perez is a vibrant, energetic soul who exudes her love of children. Her teaching style offers wonderful imaginative ways of helping children engage in active learning. Beth and I introduce her to P.I. Gumby. She beams with excitement when I tell her our promotion whereby we encourage people to take Gumby with them, both in their travels, or at work, and we post the photos in social media outlets with links to their website. Smiling, Sabrina carries P.I. 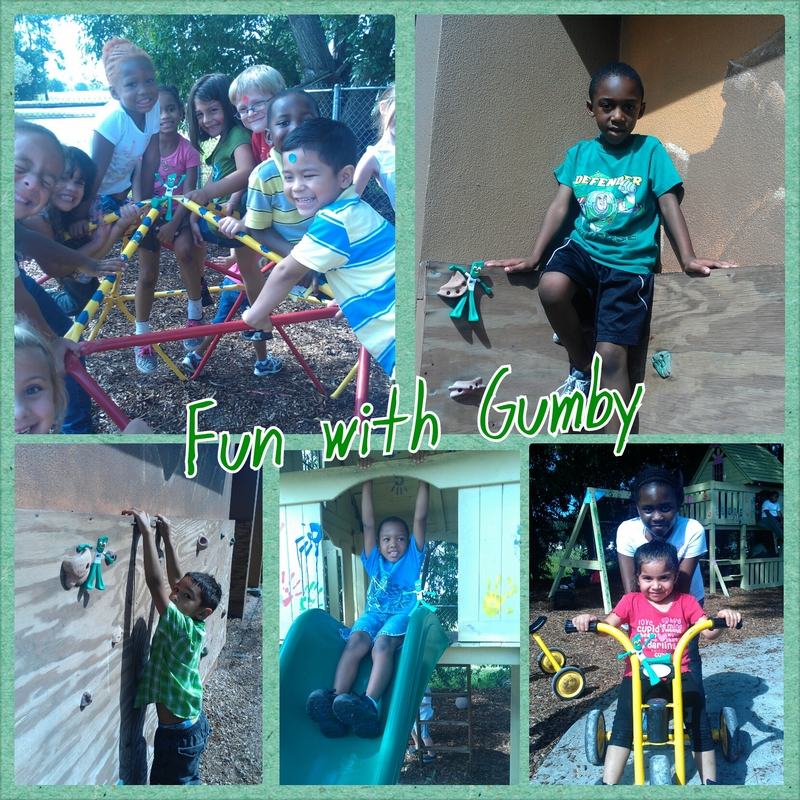 Gumby off to plan fun ways to use him as an educational instrument. This clever collage is a result of Sabrina’s creativity. We wind our way through the mosaic tiled walkways lined with art prepared by the children and teachers, see the vegetables and native Florida plants growing. They invite parents to sit at the picnic table and watch their children “Show & Tell” of the activities they’ve been doing, giving the parent a first-hand view of what their children are learning at this child care facility. The tour is available to anyone interested in finding more about this influential organization, and incredible educational asset for our community.